Ultra endurance athletes normally frown on speedwork as it’s normally reserved for pavement-pounding roadies. As trail purists go, they would rather stay the trail than step foot on a track, let alone lace up spikes and run a few 400m intervals. If you’re looking to gain speed, and cut some time off your next race, let’s take the track to the trail and do some speedwork. Speedwork by definition is a top-end high aerobic stimulus, normally comprised of sprinting and maximal energy usage. We’re going to bend the naming convention here and define speedwork here as a high aerobic, high lactate producing effort(s). The key to getting results is based on the transitive property of high aerobic training (speed work). For a moment imagine a scale where the top of the heart scale (Zone 4 and Zone 5) are your aerobic limits (VO2 max) then Zone 2 is going to be your aerobic threshold. If we want to shift our average pace in our Zone 2 aerobic zone, we need to occasionally stress the top end to help shift the scale in your favor. There are three distinct advantages to regularly doing speed work. The first is efficiency, as detailed above by stressing our top end; we can operate at a lower heart rate for the same average pace. 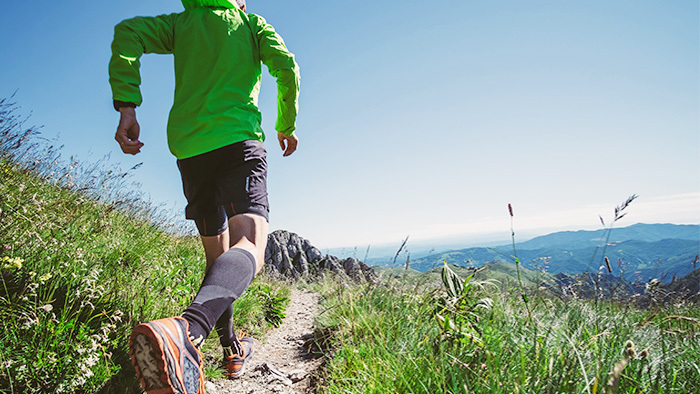 The second is repetitive stress injury prevention; aerobic running day after day on the same terrain can lead to repetitive stress injuries and muscular overcompensation. By opening up our gate and increasing cadence we will recruit different muscles and challenge our entire neuromuscular system. The last is the metabolic advantage, working your carbohydrate burning system at the top will help you burn fatty acid more efficiently in your Zone 2 aerobic state. Now that we know it’s good for us, how can we apply speed work on the trails? Hill workouts can range from short bursts for muscular recruitment to sustained climbs of three to five minutes. In short, hills are a great introduction to high-end aerobic work and a great precursor to more high cadence leg speed work traditionally seen in track speed work. If you’re bored with hill workouts, fartleks are a great way to mix in some speed to your next run. A fartlek is defined as speedplay or continuous running where you mix in some faster running with slower running. The key of fartleks is to push your heart rate to a point where you’ll produce 3+mmoL of lactate, normally into Zone 4 or Zone 5. Fartlek workouts are very helpful to increase your total time at VO2 max. Your first fartlek might look like 40-second bursts with one to two minutes of easy running between. As you get comfortable you can increase to more of them up to 8 to 10 repeats before progressing to longer intervals. Fartleks can be a fun way to mix up a run and still get a great workout in, as well as learning where your threshold sweet spot is. Normally fartleks are a max of five minutes in length between rest periods. The big brother of the fartlek is going to be an extensive tempo. In other words, a “fun but hard” type of effort. This is a workout that will definitely require some build up to so you can sustain an extensive effort of this magnitude. This tempo is going to be high Zone 3 into Zone 4 for heart rate and will provide a consistent amount of lactate, which over time will teach your body how to mitigate lactate. Each workout should build the total amount of time at this heart rate until you can hold the five-minute fartlek. These efforts can be sustained upward or 10 to 30 minutes, depending on your training goals. This tempo can also be used for extensive climbs beyond the five-minute mark, and is a great way to work on increasing your climbing efficiency! It doesn’t always have to be flat and fast. The amount of rest for these efforts should be longer (in the range of three to five minutes), done as an easy jog or static rest. So where do intervals come into play? Normally intervals are characterized by alternating high-energy output running and static rest. These are best used for days you can’t get on the trail, or when you are looking to “session” a certain section of trail. Think of it as a way to work on technical skills or raw speed. This can be a fun way to work on pushing out of switchbacks, tackling a tough section of terrain, or managing a short grinding hill and recovering afterward. Intervals are the exception to the rule and can be more targeted for a specific distance or time. Intervals can be a great gauge of fitness! Anytime you add in a new tool to your training, it can leave you feeling its effects for a few days. It’s highly advised that you start off conservatively and see if it’s something you’re comfortable with on trails. It’s also recommended that unless you’re extremely confident to not conduct speedwork on long, technical downhill sections. Overly speedy legs, technical terrain, and a brain starving for oxygen can leave you with a few extra bumps and bruises. So can speedwork be the magic bullet to your best season yet? Improving your ability to sustain Vo2 max efforts is directly correlated with aerobic and endurance improvements. If you’re looking to cut time from your next trail or ultramarathon, kicking it into high gear might just be the thing you need!